Nothing beats a good old fashioned pan of cornbread sizzling in an iron skillet. Preheat oven to 400 degrees. Place lard in an iron skillet and melt in the oven. Mix all wet ingredients (except lard), add all dry ingredients and mix well. 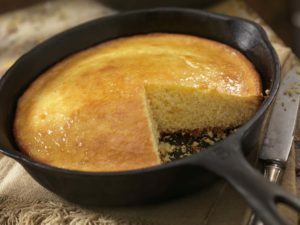 Pour in iron skillet. Bake 30 minutes.